This new J&M Performance BT-03 series Bluetooth helmet headset has been designed for installation into most flip-up modular, full-face or open-face style helmets. This headset features our miniature boom style microphone, ultra-slim mount-in-helmet speakers in stereo and new full-featured BT-03 Bluetooth control head with easy to install clamp-on mounting system. 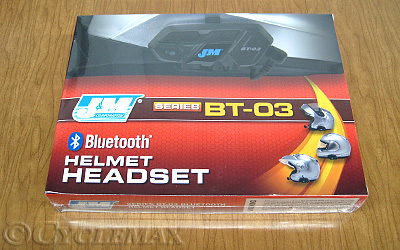 What separates J&M's Bluetooth® helmet headsets from all the rest? • The audio performance of J&M's elite series Bluetooth headsets will rival that of our best corded headsets, so you don't have to sacrifice good sound when going wireless. • Our performance series features the boom style AeroMike VI microphones for the very best in wind and ambient noise cancelling at highway speeds.